Our chill out décor is great for various events. Many people are adding chill out décor to their mehndi parties. We can create an area which comprises of a main bench with 2 side benches. The centre can be left empty or with floor mattresses and cushions giving both floor seating and higher seating options to your guests. We also have colourful stools which can be used in various ways. A popular option is to have 4 stools around a small table. 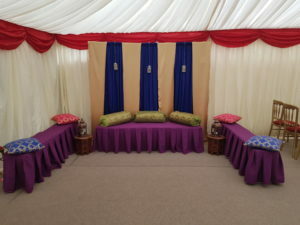 This can be used as a mehndi unit where guests get their mehndi done or a drinks area providing an intimate atmosphere. It is not just for mehndi parties but an event which requires seating, especially in marquees and home. Although halls will provide you with seating, our colourful stools will give you that chill out theme.